I visited Walt Disney World for the first time in 1986. I was just about 2 months shy of being 12 years old when we went. That very first visit was such an amazing adventure in my mind and it was the start of my life-long love for Disney World. My mom and her sister had been planning on taking all of us for I don’t know how long. I mean literally, I have no idea how long they planned our trip. I just remember that one day my mom and aunt told everyone that we were going to Disney World. “Everyone” consisted of my mom, dad, my sister, me, my aunt, uncle, and their 3 kids (2 boys and one girl), and my Godmother, who was my aunt’s mother-in-law. The rest of the kids and I ranged in age from 9-15 years old. Thinking back, I was just kind of like “Oh, that’s nice” about the news of our Disney World trip. I didn’t really know much about it except that it was an amusement park of some kind. Heck, we’d gone to small amusement parks before so this was just a different one that we were going to spend 3 days driving to. Yes, back then the speed limit and the number of us in tow made it take 3 days to drive there from Texas. We all rode in my aunt and uncle’s Suburban and pulled their 10 person camper/RV. 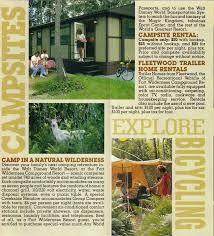 We were going to be staying at the Disney campground…which I didn’t learn the name of until we arrived. Some of the highlights that stood out about our road trip include when we had a blow out and the tread from the tire made a loud sound like a machine gun (or what I thought a machine gun sounded like thanks to TV) and scared the ever living crap out of me. We couldn’t find a campground to stay at that first night and we stopped in Louisiana at a Popeye’s Chicken where I had my first taste of Cajun spicy chicken (because it was late and that’s all they had left) and I loved it! The last highlight of our road trip was me being freaked the heck out at the K.O.A. campground on the second night because the shower room had spiders in all of the shower stalls. I told my mom I didn’t want to shower because of the spiders and she made me shower anyway. I really, really hate spiders. 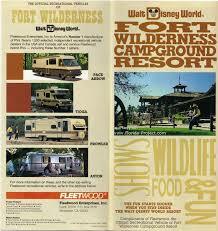 So my very first Disney World experience was arriving at Fort Wilderness Campground. I remember thinking how nice everything looked. We were really close to the comfort station where there were super clean, air conditioned bathrooms and showers (with NO spiders). This was super amazing because we thought we’d have to all use the bathroom and shower in the RV. 10 people sharing one RV bathroom was not going to be fun. During that visit we walked to different areas of the campground and just enjoyed being all together when we were there. I also figured out that Florida had very soft water compared to back home and it took me forever to rinse the shampoo out of my hair. The trading post (read, gift shop and country store) was where I fell in love with how well Disney themed everything! It was the cutest place and all I remember is that I wanted a stuffed toy of Goofy wearing pioneer clothing complete with a cute racoon skin hat. I didn’t get him though. Instead, both my sister and I got these old looking pioneer guns. I got the pistol and she got the little shot gun. Those things were awesome! They were just toys but were very well made with wood and metal. We thought we were so cool! We kept those things for years! My favorite memory of the Fort Wilderness Campgrounds is when we went to Chip and Dale’s Campfire Sing-a-Long. Or at least that’s what I think it was called. I remember at first when we got there, there were just a few families with small children. I was telling my sister and my cousins that it was dumb for us to be there because we were all too old for this. But then more people showed up, some without any kids at all, and the sing-a-long began. I smiled from ear to ear the entire time and I was captivated by how fun it was! After it was over, we were waiting to meet Chip and Dale when a Cast Member came over and started talking to the entire family. She turned to all of us kids and asked if we knew how to tell Chip and Dale apart. I glanced over at the chipmunks and for the first time even thought about the fact that I didn’t know who was who. She taught us that Chip has a chocolate chip nose, so we could always tell them apart by their noses. You would have thought she told me some highly guarded government secret. When we got home, I told my friends about this Chip and Dale revelation and they couldn’t have cared less. Anywho…the majority of my memories from this first trip were from our time at the campsites, but I do have to say that our visit to Magic Kingdom and Epcot are what made me fall in love with Disney World. Our very first time going into the Magic Kingdom, I was just walking around in awe with my mouth hanging open. It was just all too much! I was seeing and hearing so many magical things, and seeing the castle! Back then, the characters just walked around all willy nilly and people just waited in an unorganized form to get pictures and autographs. For some reason, the only ride I remember going on from that trip was the long gone If You Had Wings in Tomorrowland. I know we went on almost every other ride that we could fit in because my aunt had managed to plan enough for us to see a lot. She hustled our little butts all over both of the parks to get in as much as we could while we were there. At Epcot I felt like we’d stepped into the future and I was amazed by World Showcase. Even though I was so tired by the end of our vacation, I didn’t want to leave. Luckily, my parents fell in love with Disney World too and my sister and I were able to go back almost every single year with them until about 2001. After then, they began to lose interest (and also started having knee issues) and decided that they wouldn’t go anymore. I’m not to that point yet, even though my kids are. Hopefully in the future my kids will be ready to go back and make more memories with me! Until then, I’ll be making memories with some of my friends! I can live with that for now! Posted by Shandale on August 3, 2015 in The Daily Post and tagged Disney, Disney Blog, Disney Magic, Disney obsession, Disney Parks, Disney Trip Report, Disney Vacation, Disney World, Disney World Trip, Epcot, Fort Wilderness, Fort Wilderness Campground, Magic Kingdom, Road trip, Solo trip, Walt Disney World, WDW, YouTube channel.